Approximately 4.5 million Palestinians from the remainder of the occupied Palestinian territory (oPt) are prohibited from residing in East Jerusalem and cannot enter the city without Israeli-issued permits, which are difficult to obtain. Those who obtain permits can only use three of the 13 checkpoints along the Barrier. Tens of thousands of Palestinian residents of East Jerusalem are physically separated from the urban centre by the Barrier and are effectively abandoned by the municipality; they must cross crowded checkpoints to access health, education and other services to which they are entitled as residents of Jerusalem. 35% of the land in East Jerusalem has been confiscated for Israeli settlement use; only 13% of East Jerusalem is zoned for Palestinian construction, much of which is already built up. At least a third of all Palestinian homes in East Jerusalem lack Israeli-issued building permits, which are difficult to obtain, potentially placing over 100,000 residents at risk of displacement. Since 2000, the Israeli authorities have demolished some 1,400 houses and other structures in East Jerusalem. In 2016, East Jerusalem recorded the highest number of demolitions since 2000. At least 180 Palestinian households in East Jerusalem are at risk of forced displacement due to settler activities, particularly in the Old City, Silwan and Sheikh Jarrah neighbourhoods. There is a chronic shortage of classrooms in East Jerusalem: 2,600 additional classrooms are required to accommodate Palestinian children and many existing facilities are substandard or unsuitable. 76% of Palestinian residents of East Jerusalem and 83% of the children live below the Israel-defined poverty line. Israel’s annexation of East Jerusalem and of the surrounding West Bank hinterland contravenes international law and it is not recognized by the international community. Israeli settlement activity in East Jerusalem is illegal and occurs at the expense of land and resources for Palestinian construction and development. Many Palestinians in East Jerusalem are at risk of forcible displacement from demolitions, settler evictions and revocation of residency, due to their lack of a secure legal residency status. In the long term, failure to address these factors risks undermining the Palestinian presence in East Jerusalem. Palestinians in East Jerusalem benefit from certain advantages compared to their counterparts in the rest of the West Bank, in particular regarding freedom of movement and access to the Israeli health system. However, they face significant constraints in accessing housing and services due to a combination of a restrictive planning system and a discriminatory allocation of municipal resources. Due to the Barrier’s deviation from the Israeli-declared municipal boundary, certain Palestinian areas in East Jerusalem are physically separated from the urban centre, and have been effectively abandoned by the municipality. Basic facilities and services are degraded or lacking entirely, forcing residents to cross checkpoints to access health, education and other services to which they are entitled. The Palestinian Authority has no jurisdiction in these areas and the Israeli police seldom enter, thus creating a security vacuum manifested in unsupervised/wildcat building, as well as increasing lawlessness, crime and drug trafficking. 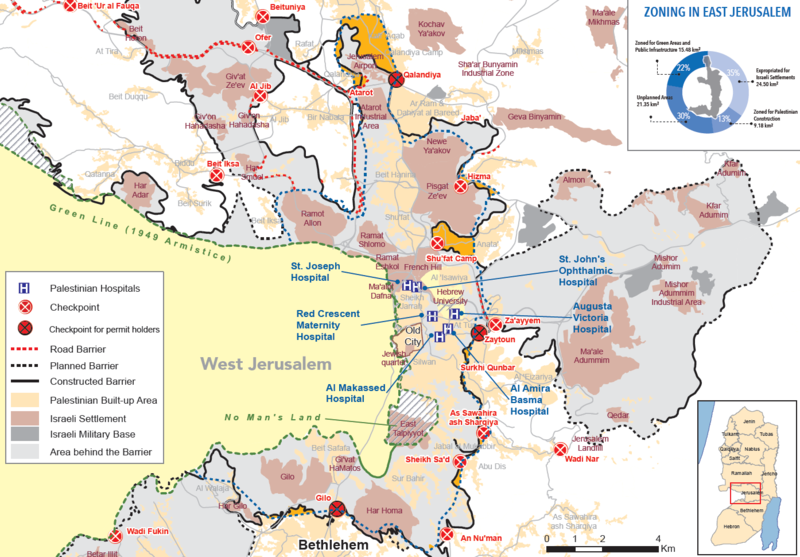 Israeli measures, including the annexation of land, the construction of the Barrier, and the use of the permit regime, have increasingly cut off East Jerusalem from the rest of the oPt. These measures impede access of Palestinians from the rest of the oPt to services in East Jerusalem, including health facilities that provide specialised and emergency health services. Physical and bureaucratic obstacles also restrict access of medical staff to hospitals and clinics, access of students to their schools, and the enjoyment from normal family life. See UN Security Council resolutions 252, 267, 471, 476 and 478.